A stye, in medical terms, is a furuncular inflammation of the connective tissue in the edge of the eyelids, along with a hair follicle. The bacteria called staphylococcus aureus is usually responsible for the appearance of styes that, in addition to annoying and unsightly, also be painful. Completely eliminate the stye may be a matter of patience because it can take up to two weeks to heal. There are other causes that may be behind the appearance of styes, such as chronic inflammation of the eye or blepharitis, stress and hormonal changes. The most common symptoms of stye in addition to inflammation of the eyelid are redness, feeling of itching and pain, discomfort when blinking, lacrimation, blurred vision, secretions of the eye and constant appearance of crust. If symptoms worsen or persist, remember that you must consult with a doctor. A first advice is that you avoid touching with your hands, squeeze or try to remove the sty. In fact, to prevent the spread of infection must be very careful with hygiene and avoid using makeup and contact lenses. 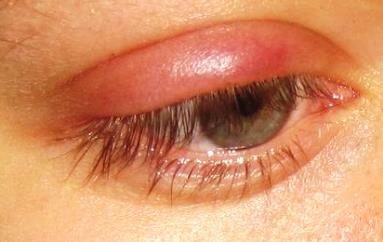 To relieve discomfort of the stye we have some effective natural remedies. The first of this is the water to clean the infected eye. To do this, you have to boil a liter of water and let it cool before moisten a cotton ball and place it directly on the eyelid, for about 10 minutes. Another effective remedy against styes are tea bags, soaked in a cup of boiled water. Place the tea bag on the eye for 10 minutes once a day. Chamomile also helps relieve annoying symptoms of stye, following the same process with tea bags and being able to apply it 2 times a day. The cilantro is considered a very effective remedy. Add a teaspoon of seeds in a cup of boiling water and let stand a few minutes. Cool, strain and wash the affected eye 3 times a day. Another natural remedy, especially effective for its antibacterial effect, is turmeric. Add a teaspoon in 2 cups of water and cook until half the water evaporates. Strain well and, using a dropper, add three drops in the infected eye between 2 and 3 times a day. And a remedy also refreshing, to relieve the pain and to lower the inflammation, is applied directly on the eye a slice of cucumber, of astringent effect.